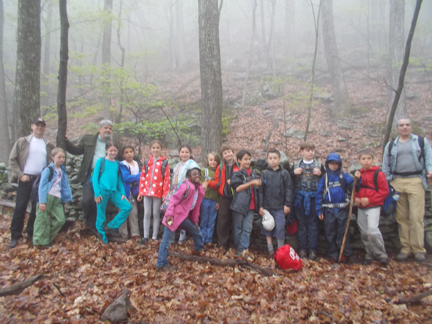 Glenn Kreisberg, Overlook Mountain Center (OMC) Guide, talks to 3rd grade students, teachers and parents from Mtn. 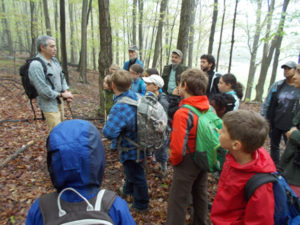 Laurel Waldorf School in New Paltz, during a field trip to the Overlook Mountain Petroform Preserve in upper Lewis Hollow. 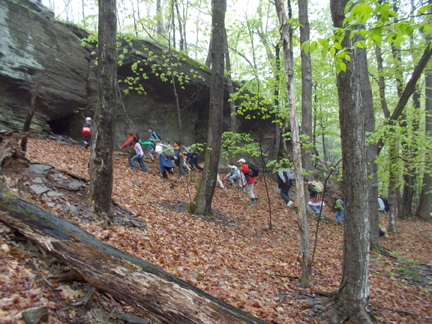 The newly acquired 37 acre site, purchased for preservation and research, was used for encampments by woodland Indians for thousands of years and contains evidence of Native American rock shelters, as well as, past bluestone quarrying activity, colonial survey markers and subdivision walls.